It's Colorado week, which remains a strange thing to say at Nebraska these days. At the start of this current decade? Totally normal. Both sides knew exactly which week that was each season. One conference change each, however, and this rivalry renewed feels strange, like the person at your high school reunion who really wants to cruise the main drag or hit up the old haunt for old times' sake. I mean really wants to. Everyone else gets the nostalgic appeal of the idea and admits "those were the days," but this person is convinced those days don't need to be past tense. If you just do what you once did, it'll be like no time passed at all! Former Colorado head coach Bill McCartney might be that person this week, and that doesn't feel strange at all. If you grew up a Husker fan thinking Nebraska and Colorado were rivals –– and there's a swath of the fan base that did –– perhaps the primary reason why is McCartney. He set out to create a rival and did. A conscious decision he made 26 years ago remains something McCartney still gets asked about today. "I'd rather be dead than red," McCartney said at Colorado's press conference this week. At the same press conference Mike MacIntyre downplayed it. In Lincoln, Scott Frost mostly did the same. But McCartney? He has to play the hits. He's that guy. This was his thing, and you sort of have to tip your cap to him. While McCartney only went 3-9-1 (.292) against Nebraska during his Colorado tenure, you have to consider all of the theatrics –– no red cars or clothing, putting the game in red on the schedule, etc. –– a success. While McCartney only beat Nebraska three times, two of those wins came during a three-year stretch (1989, 90, 91) in which Colorado really was a contemporary of Nebraska, a rival, better than the Huskers in 1989 and 1990 (at least based on the final rankings) and about the same in 1991 (fitting given the teams tied that year). By constructing a rivalry out of whole cloth, McCartney raised the level of his entire program. College football remains a sport ruled by the aristocrats. Challengers to the hierarchy are rare. Between 1990 and now there have only been three schools to join the national champions' club –– Florida, Florida State and Colorado. Every other national champion over that span already had one prior to 1990. And for a Colorado perspective, that's remarkable. It explains how McCartney could say Nebraska-Colorado is "more important than any other game." He said that this week. While it would be fun if that were the case now, McCartney might be the only person on earth who can say that without qualification. He wanted it that way, and made it that way. Gotta give him credit for that, even if it's not quite so easy for everyone else to feel the way they once did. With this I think we can finally move on, but here's Akron Coach Terry Bowden's perspective on last Saturday's cancelation. 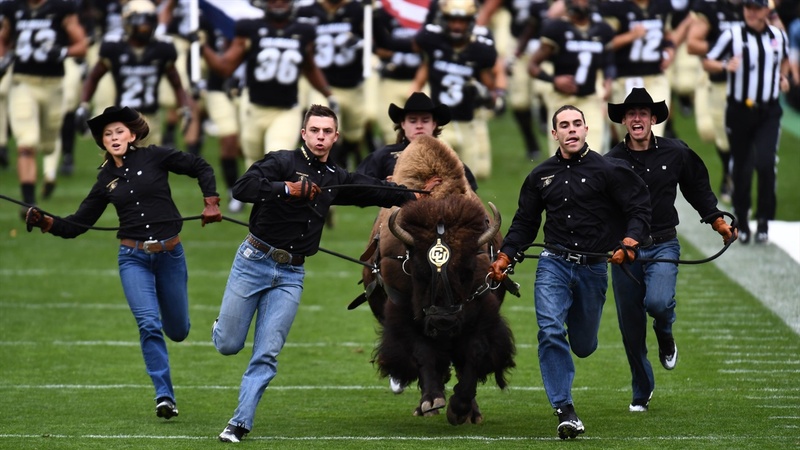 Keep an eye on Colorado linebacker Nate Landman this Saturday. He took home the Pac-12 Defensive Player of the Week this week. Should Penn State and/or Michigan State fans be worried after close Week 1 games? Advanced box scores are here! ICYMI: A new Lo-Down looks at blocking skills, Nebraska landed a JUCO running back, Mike Babcock on Nebraska's new gold shirts and the 1983 Colorado-Nebraska game.